Sony today said it plans to bring its Xperia X range of handsets to the U.S. market beginning in June. The Xperia X is available for preorder starting today from Amazon, Best Buy, B&H Photo Video, and Reagan Wireless for $550. The phone ships June 26. Preorders for the Xperia X Performance, Xperia XA, and Xperia XA Ultra begin June 19 and ship in July. The X Performance costs $700, the XA costs $280, and the XA Ultra costs $370. Sony is offering three free Sony Pictures movies and the Sony Quick Charger with preorders for all four phones. Sony initially announced the Xperia X series at Mobile World Congress in February. The X series replaces the Z series as Sony's main line of smartphones. The X and X Performance are the high-end models, boasting 23-megapixel main cameras, 13-megapixel selfies cameras, and 5-inch full HD screens. The phones include support for some US LTE bands, but Sony has yet to specify which. People who preorder the Xperia X and X Performance will receive a 128 GB memory card. The Xperia X is an unlocked Android smartphone that Sony is selling directly to consumers. The phone departs from Sony's Xperia Z series in ways that are both good and bad. The X Series is an interesting new range of phones from Sony. Although they all look similar, the various specs cover a surprisingly wide range of the market from affordable to high-end, the models hit on a number of current trends. Today Sony announced the Xperia X series at Mobile World Congress in Barcelona. The new phones focus on performance in two core areas: camera and battery. Sony today highlighted which devices it plans to update to Android 7 Nougat. 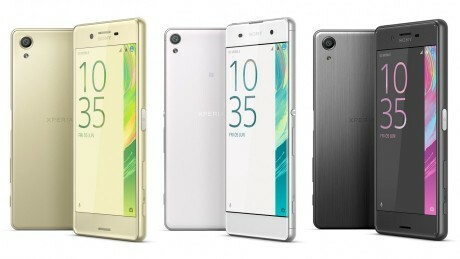 Sony will make Nougat available to the: Xperia Z3+ and Z4 Tablet; Xperia Z5, Z5 Compact, and Z5 Premium; and the Xperia X, XA, XA Ultra, and X Performance. Sony today said it plans to bring its new X Series handsets to the U.S., even if only via its own online sales channel. The company reiterated its commitment to the U.S.